By Alison Weir, ifamericansknew.org, 2014, paperback, 240 pp. That, as Alison Weir has made clear, is Israel’s situation. 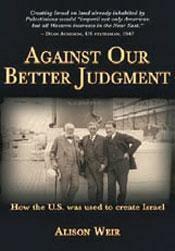 In Against Our Better Judgment, Weir writes with great clarity how the Zionist movement was able to move politicians, both in America and in England, to legalize a most illegal act—that of stealing an entire nation—and crying foul when those from whom it was stolen complained, then tried to retake the land. Weir’s in-depth research to expose Zionist actions in earlier times provides a solid basis for her conclusions about creating Israel from a land called Palestine. And she documents the intense lobbying done by Israel’s Zionist creators and their American and British fellow travelers. We are now living with the consequences of that bit of grand theft, i.e., the continuing violence in the Middle East, affecting everything America might want to do in the region. We only recently witnessed Bibi Netanyahu’s so-far-failed effort to have America invade and conquer Iran, a country that obviously is too much of a mouthful for Israel to bite off itself. Suddenly, even Barack Obama recognizes the danger in following Israel’s advice on how to conduct itself in the Middle East. The president tiptoed to the edge of the abyss but backed away when Israel’s trained seals in the U.S. Congress tried to push the nation over the edge. We saw congressional supporters of Israel shamefully initiating the dozens of standing ovations when a Joint Session of Congress entertained Prime Minister Netanyahu, who obliged the assembled mass with aggressive applause lines designed to favor those who have a penchant for violence and to show how Israel is “America’s staunchest ally” in the Middle East. So Senator Javits asked him again, and again, and again, trying to have a statement from some government official which Israel’s Lobby could use in its propaganda campaign to maintain Israel’s lofty position in the American mind. But the State Department official was unable to come up with an answer, which left Senator Javits and his cohorts to try some other avenue. The Israel-is-a-vital-ally shibboleth has since been made into an overused slogan by supporters of Israel. But each time I hear that phrase, “staunchest ally,” I think of the American sailors on the U.S.S.Liberty, who, during the 1967 Israeli-Arab War, died when the Israeli military was ordered to destroy its “ally’s” intelligence ship. During that act of friendship, America’s staunchest ally killed some 34 American sailors, and wounded another 170. With Weir’s well-researched history in mind, I am forced to think of the cadre of American journalists who lately have assigned “oil” as the reason for George Bush’s folly—the 2003 U.S. invasion of Iraq. They say nothing of the well known fact that George Bush had a number of Israel’s supporters giving him advice on the issue of Iraq. I’ve lost count of the billions of American dollars that were sucked up by that war, as well as the precious American lives that were lost to satisfy Israel’s agents in the Bush administration, those who convinced President Bush to do something that Israel wanted, but knowing it was better if “America did it.” President Obama should be applauded for refusing to fall into the same trap with respect to Syria. This provocative book documents a history that is essential in understanding today’s world. Scholarly, yet readable, it is a must for all Americans. We all need to know what we have spent by coddling Israel and its aggressions, and why the cost has become more than we bargained for. James Abourezk is a former U.S. senator from South Dakota who plunged into the Middle East morass when he saw the cost to our country of Israel’s efforts to connive to have our country do Israel’s dirty work.